← Why bother to sit in with customer service? How do you teach your work force that mistakes are OK as long as they learn and don’t repeat them? By being a visible example. A friend and fellow CEO states that he publishes each of his mistakes in his company internal blog along with the lesson he learned. “If the CEO can do this, he gives permission for anyone to confess as well,” he states. You may not know it but the National Transportation Safety Board has for years offered a reporting program for pilots, air controllers and others involved in aviation safety. Anyone reporting an accidental safety error (such as flying into restricted airspace) within ten days is granted immunity from FAA prosecution, as long as the mistake was not an intentional breaking of the law. Even NTSB understands that mistakes are learning experiences as it insulates accidental infractions from prosecution in order to learn and solve problems communally. What is your culture? Do you respond to an employee mistake with a warning or even punishment? If so, it is a sure thing that fear will cause your employees to hide them, cover them up with quick fixes if possible and worry over the consequence of creativity efforts or of pushing the envelope a bit. Doesn’t the whole enterprise fail a bit each time a learning opportunity is lost or someone hides actions from management? And what does it say about your corporate culture and your individual management style? Even if you condone the overreaction of others in management, aren’t you then guilty of reinforcing such a culture of punishment over learning? Celebrate your mistakes. Others will follow. All will learn to share for the sake of safety, growth and open culture. This entry was posted in Depending upon others, Protecting the business, Surrounding yourself with talent, The fight for quality. Bookmark the permalink. 5 Responses to Celebrate your mistakes! 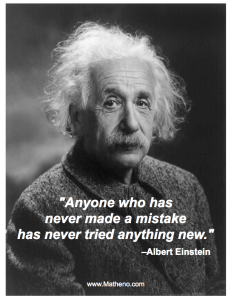 Good advice about learning from mistakes. While I’m not sure I would ” celebrate mistakes ” since they represent a lot of wasted time, effort and money – it’s important to understand what happened, how a better outcome could have occurred or a bad situation could have been avoided. …. by being open about issues and realizing there is a lot to know to achieve success. Since this is not always the case because of ego, nativity, poor look ahead, not changing or adapting quickly, etc. – is why venture investing is very risky. And why there is very high value on founders that learn fast and investors who meaningful contribute to building a successful business and creating significant wealth for stakeholders. ….that fast tracks producing results and getting past ” don’t know and don’t want to know ” situations ! I like and subscribe to today’s message, but here’s a real life question for you, and I’m probably not the only leader that struggles with this; what about those employees who come from a fear based environment, not knowing that there really are employers out there who follow the standards you’ve outlined. What are some practical suggestions that you can provide that may aid me and others like me, in identifying who these employees are and how to walk them back into the light? Great info for all. You are amazing!